JustFundraising wants to work with you to help the victims of Hurricane Harvey. Together, we can make a difference for the victims of Hurricane Harvey! Now's your chance to help! Get a group together to raise funds quickly and easily with Hurricane Harvey Relief Donation Cards. JustFundraising.com will provide these cards to approved groups absolutely free. Hurricane Harvey is being seen as possibly the worst tropical storm to impact the United States in recent years. Hitting Houston and the Gulf Coast with alarming winds and record levels of rainfall. More than 300,000 people have been affected by this natural disaster. Many left without electricity or places to call home. An estimated 35,000 homes have been destroyed. The death toll has already reach 30 confirmed flood-related deaths. Those are the startling numbers that indicate the scale of the devastation from the huge hurricane that struck the coast of Texas. 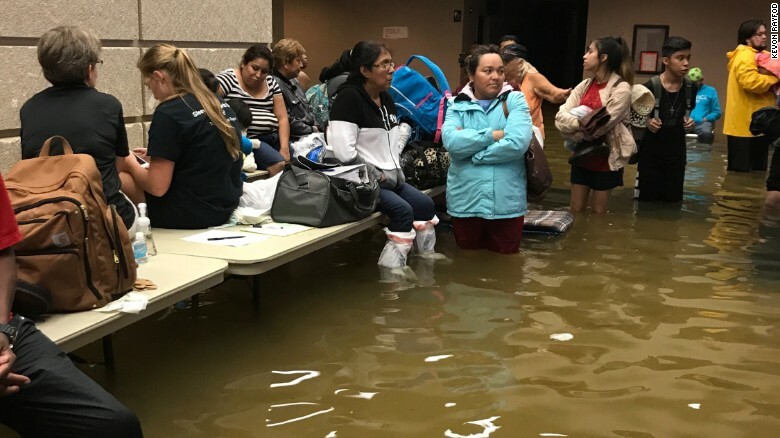 Heartbreaking scenes of suffering and loss are playing out across this shell-shocked state as it reels from the largest hurricane since Katrina. After seeing the damage that Hurricane Harvey did to Houston, Port Arthur has been the latest victim to be swallowed by Tropical Storm Harvey. With water levels rising, the whole city is underwater. Many hundred thousand people have lost everything and they'll need our fundraising assistance to help them get back on their feet again. Funds are needed for new clothing, shelter, food, building new homes and for other simple every day needs. What are you waiting for? Let’s make a difference. Click here to order your 'Free Victory Scratch Cards for a Cause'. Then be sure to donate to a worth charity to help victims of Huricane Harvey. Step 1 We'll provide you with up to 20 Tropical Storm Harvey Donation Cards (depending on the number of fundraising participants). Distribute 1 donation card to each of your helpers. Each donation card has 56 scratch dots. Step 2 Fundraisers ask friends, neighbours, and co-workers to scratch 1 or more dots and then pay the total of the amounts that are revealed ($0.50 to $3.00 per dot). Supporters will also find a positive inspirational message (like a proverb) underneath each scratched circle. For example, they will find maxims such as “Ideas are nothing without action” which, are meant to instil hope and encouragement during times of distress and grief. Step 3 Accumulate all collected funds and write a check out to United Way or Red Cross or any other preferred non-profit organization dedicated to the Hurricane Harvey relief effort. These cards regularly sell for $15 each but JustFundraising.com is providing them to committed groups absolutely free. With every 10 donation cards, your group can raise $1,150 for Hurricane Harvey efforts. JustFundraising.com is hoping to distribute up to 500 Donation Cards which would help groups raise over $57,000 for the efforts.